Hamas Deputy Chief Ismail Haniyeh has arrived in Egypt for meetings with security officials, the highest level visit by a member of the Palestinian militant group since Egypt’s army overthrew an Islamist president in 2013. 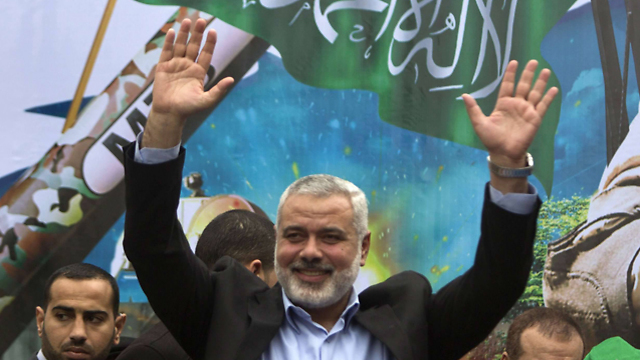 Haniyeh arrived late Sunday, Egyptian security officials said, as Hamas officials confirmed the visit. All spoke on condition of anonymity as they were not authorized to brief reporters. Hamas, an Islamic terrorist group with historic links to Egypt’s Muslim Brotherhood, enjoyed warm relations with Egyptian President Mohammed Morsi, a top Brotherhood figure who was overthrown by the military after a divisive year in power. The Egyptian government tightened an Israeli-Egyptian blockade on Hamas-ruled Gaza shortly thereafter, but in recent months there have been signs of a thaw in relations. For most of the past decade, Egypt had issued a blockade on Hamas-ruled Gaza, stifling the economy and largely blocking its 2 million people from moving in and out of the territory. But after a three-year crackdown, signs are emerging that Egypt is easing the pressure in a step to repair its shattered ties with Hamas. In recent months, Cairo has increased the number of people allowed to exit through the Rafah border crossing, Gaza’s main gateway to the outside world. It also has begun to allow Gaza to import commercial goods through Rafah for the first time since 2013, and sent public signals that it is interested in improving relations. Haniyeh left Gaza in September to perform the Hajj pilgrimage in Mecca—the first time Egypt allowed him to leave the territory since Morsi’s ouster. He then went to Qatar to see Hamas leader Khalid Mashaal and discuss issues including the group’s upcoming elections. Mashaal is slated to step down from his position this spring, and Haniya is considered a strong candidate to replace him. Meshaal’s deputy Moussa Abu Marzouk is the other main candidate. Next articleWhich Jerusalem will Trump recognize?